Maggie Hope, born in England but raised by her aunt in New England, is a mathematician, a typist, and is training to be a spy. After the adventures in her first mystery, Mr. Churchill’s Secretary, reviewed here, Maggie is training with MI-5. The physical training is very difficult for the bookish Maggie, but her loyalty and intelligence are valued, so she is reassigned. 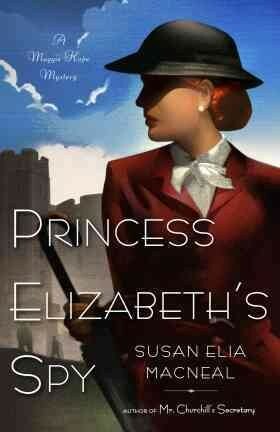 She is sent to Windsor Castle, to be a math tutor for 14-year-old Princess Elizabeth, and also to help keep her safe. The castle is huge and chilly, and Maggie is expected to dress up for dinner with the staff. Her sweetheart is missing in action, but her handsome contact with Churchill’s Irregulars is a good friend, until he too is reassigned. A sudden death on the castle grounds, and a possible plot to kidnap or harm the princess keep Maggie very busy, along with helping stage a play for Christmas. The royal princesses are charming, as is the peek inside a castle in wartime. Maggie’s distant father, a cryptographer, continues to be an enigma. A friend’s wartime wedding, a suspicious death in London, and a possible romance enliven this mystery. Two more books about Maggie Hope are planned.